Our annual report for CY 2017 is now available. Download AFOW Annual Report 2017 or view a brief summary. 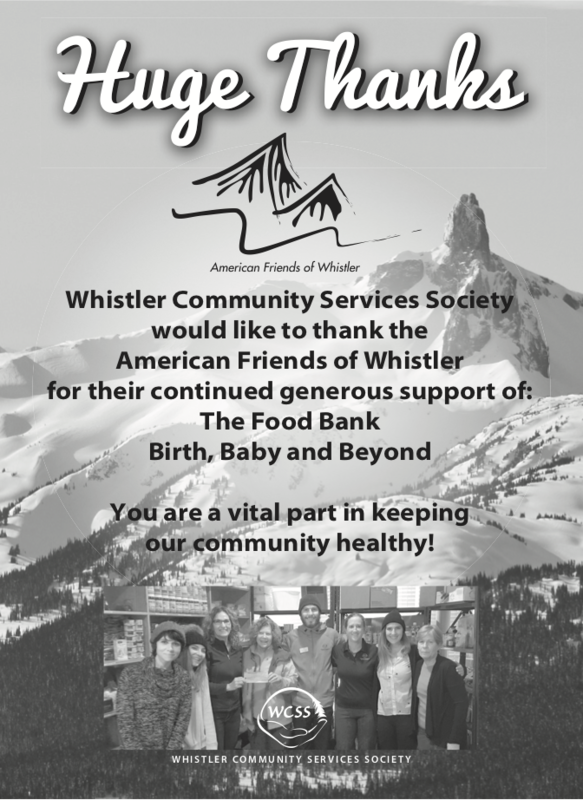 American Friends of Whistler made a recent donation to the Birth, Baby and Beyond program held through Whistler Community Services Society. 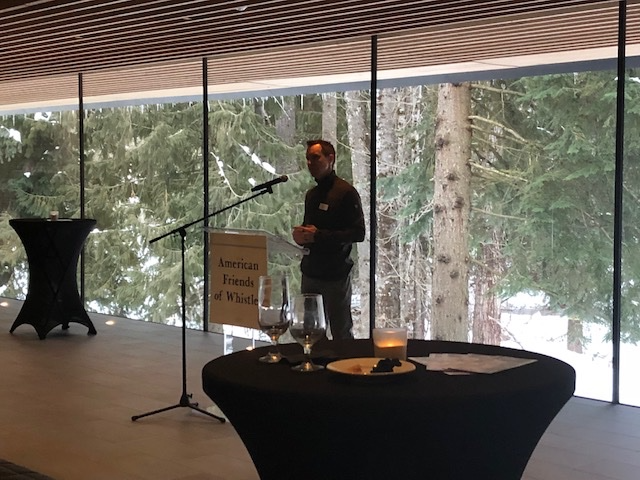 In less than four years the program has become very successful and continues to respond to the growing demand in Whistler for post natal care and support. We initially started in 2014 running 2 sessions a year which are 8 weeks in length, To meet the growing demand we are currently running 5 sessions of 8 week programming. All groups are at capacity with participants and we also generate a wait list. The program is unique as it is designed to support women in their postpartum adjustment and reduce the risks of depression and anxiety after having a baby. It is facilitated by Clinical Counsellor Candace Postal and Post- Partum Doula Julie Kennedy-Smith. 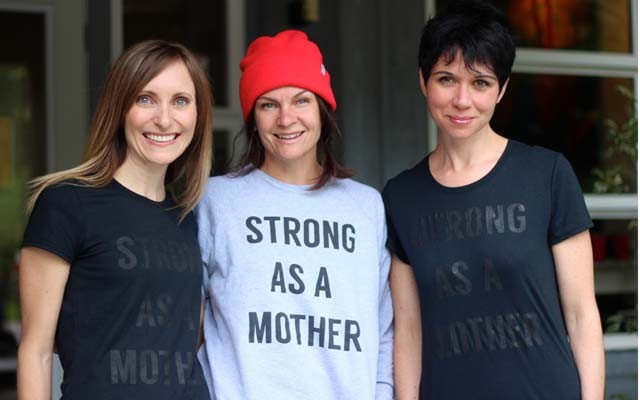 This combination of mental health and medical support for Mom and Baby has assisted in developing meaningful relationships for moms who feel isolated living in a rural community and without the traditional extended family network of aunts, uncles and grandparents. 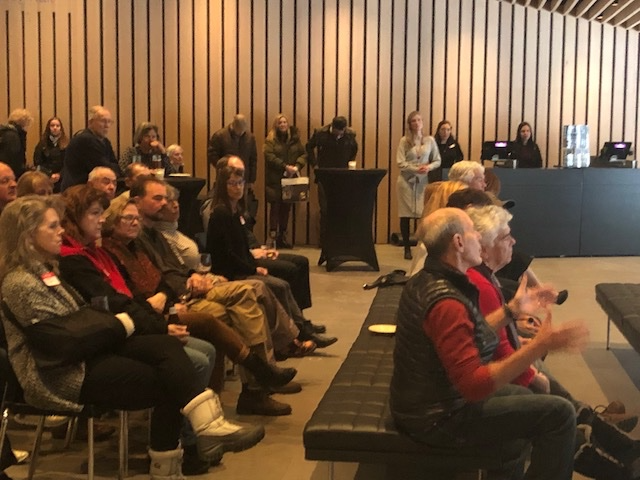 Whistler families are also at greater risk for post- partum depression and a difficult transition as they give birth outside of this community in North Vancouver and Squamish. Also most of their prenatal care can be out of community with the midwifery program and expanded obstetric care in Squamish. 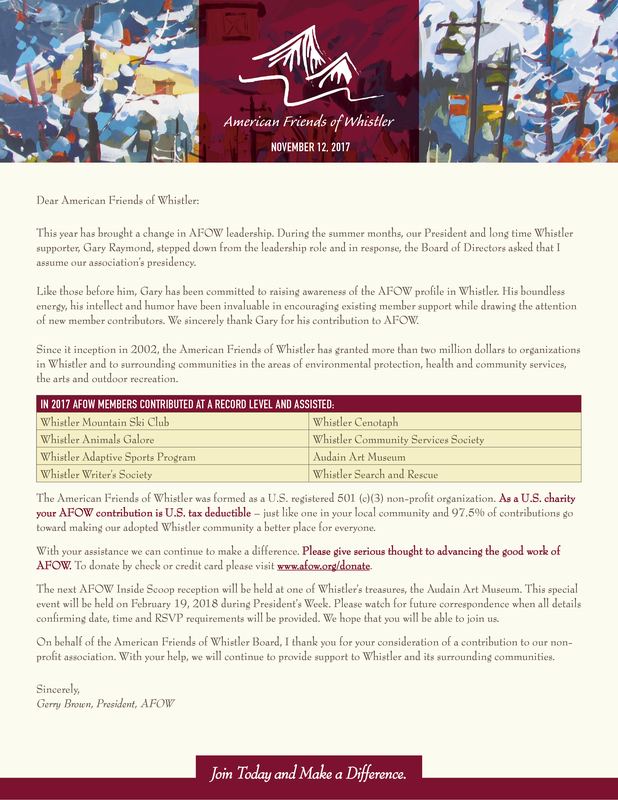 Thank you to the American Friends of Whistler for this donation. It truly is supporting our growing community. “Thank you to Whistler Community Services and AFOW for offering such a great program. Candice and Julie provided such a warm welcoming environment for a group of new moms. Their knowledge as health care professionals is great, but it was their sharing of personal experiences that truly helped me realize that many of the emotions and frustrations I feel are not only normal, but common. 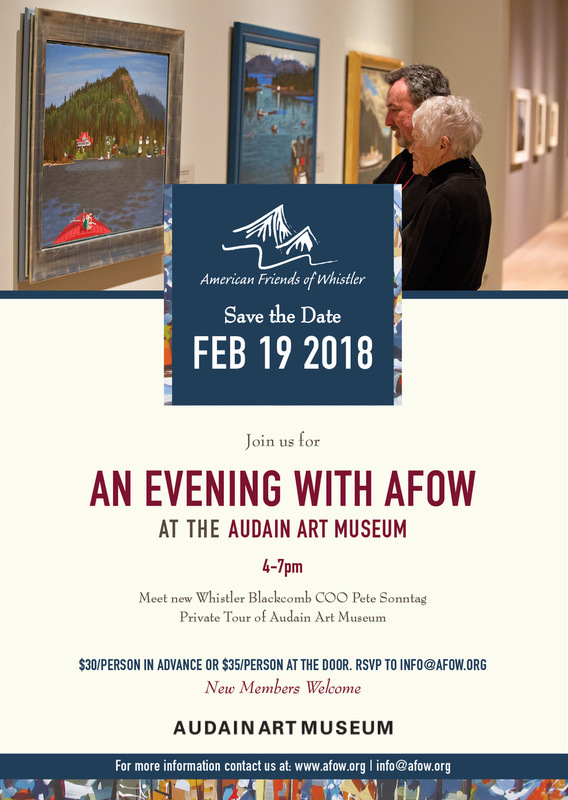 On February 19, at the Audain Art Museum, AFOW members met new Whistler Blackcomb COO, Pete Sonntag, and enjoyed a presentation about happenings on the mountains. 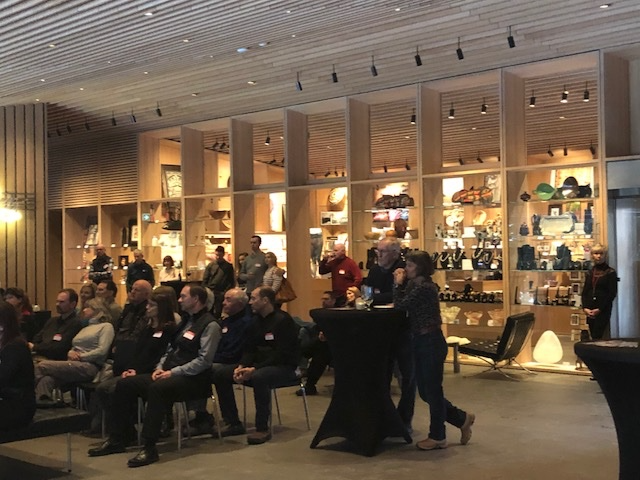 Attendees also received a special tour of the Audain Art Museum. 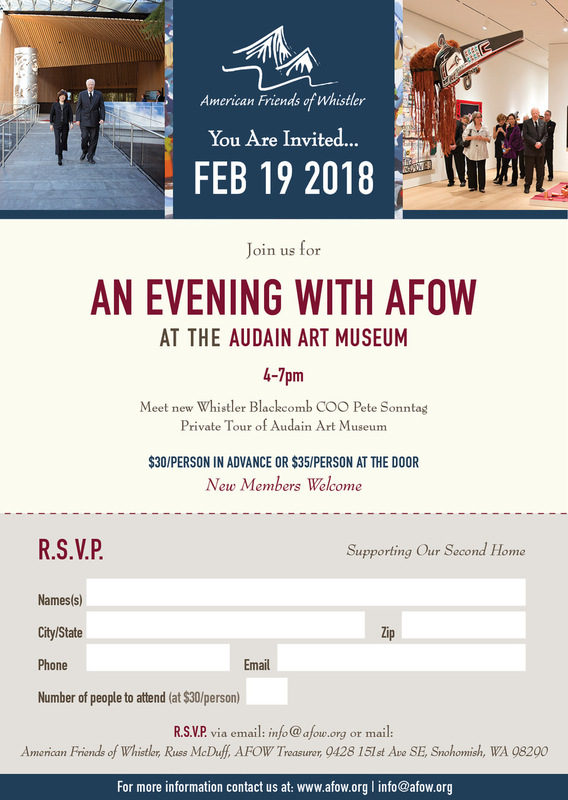 Thank you to Pete Sonntag, acting mayor, John Grills, the Audain Art Museum staff, the Adele Campbell Fine Art Gallery and all those who made this event possible. Whistler Writing Society supporting workshop series during 2017 Writers’ Festival. Whistler Remembrance Place to build new home for the Whistler Cenotaph to provide a prominent and honorable location for this monument. Whistler Mountain Ski Club supporting the USA Team at the 25th Annual Whistler Cup, one of the largest international childrens’ ski races. Whistler Animal Galore for installation of stone fence around dog run. Spearhead Huts Society for the Kees and Claire Memorial Hut for building supplies. Whistler Adaptive Sports Program for a highly specialized adaptive mountain bike for individuals with low mobility. Whistler Search and Rescue for equipment. 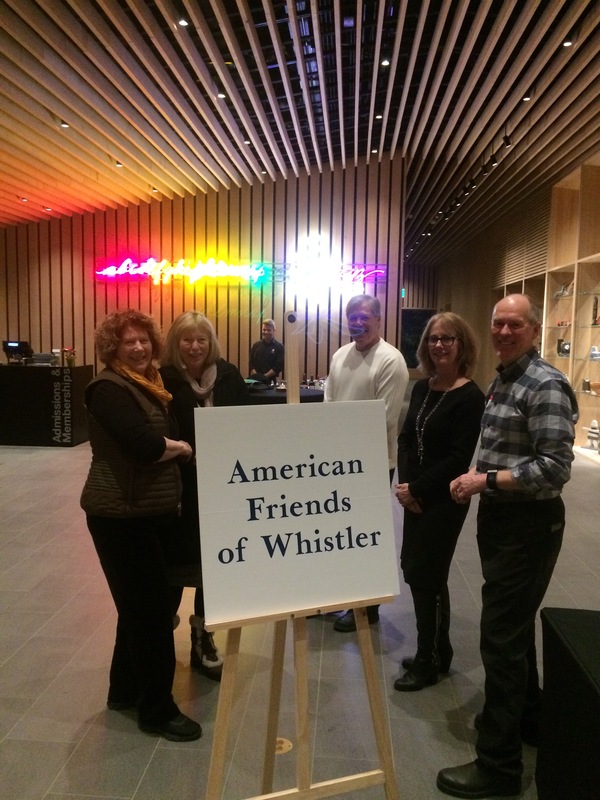 American Friends of Whistler assists an American ski club, The Downhill Derelicts, in their fundraising to benefit Whistler Adaptive Sports Program. Last year they presented a $CAD 20,000 gift to WASP and are on track to raise the bar this year. 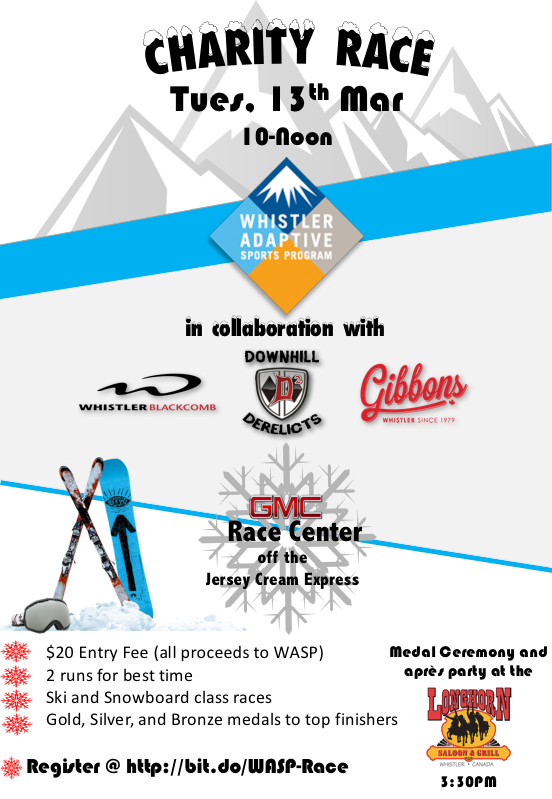 On Tuesday, March 13, they are sponsoring a race at the Blackcomb GMC Race Center.